COMPANY PROFILE American Eagle Outfitters is a retailer of apparel and accessories that also offers personal care products. It sells its products in stores as well as online. It operates stores in the USA, Canada, Mexico, Hong Kong, China and the UK. American Eagle is an apparel and accessory retailer with company stores throughout North America, China, Hong Kong, and the United Kingdom. The company leases all of its stores, and the vast majority of stores are in the United States. American Eagle also has an online business that ships worldwide. The company’s primary brand, American Eagle Outfitters, sells casual apparel and accessories that target 15- to 25-year-old men and women. Its Aerie brand sells intimates and personal-care products for women. Women’s items comprise the majority of the company’s sales. American Eagle designs its own merchandise and sources its production from third-party manufacturers that are mostly located outside of North America. 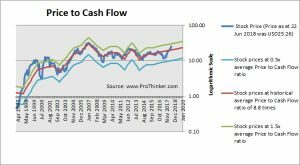 At the price of USD25.26 as at 22 Jun 2018, American Eagle Outfitters Inc is trading at a Price to Cash Flow Ratio of 11.1 times last 12 months cash flow. 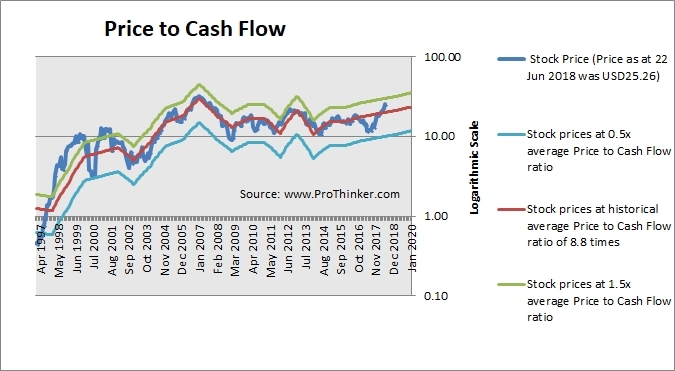 This is a 26.0% premium to its historical average Price to Cash Flow Ratio of 9.0 times.